Many of the online music distribution companies: CD Baby, DistroKid, OneRPM, MondoTunes, TuneCore etc., are either rejecting, or at least not entirely happy about accepting, audio content that has been released under a Creative Commons (CC) licence, and are not accepting it into their distribution with YouTube’s Content ID system. As a musician who has gained some exposure from releasing material under a CC licence, this is a disappointing and worrying trend, since YouTube advertising revenue (let’s call it YTAR from now) is about the only way I’ve managed to make a tiny bit of income from my music. For a very quick recap on the terms here, Creative Commons licences are a set of licences that give authors, composers etc. the ability to let other people use their material for free, in exchange for those people crediting them and, ideally, linking back to them. This is so that the author/composer’s work gets used and people get to know who they are. There is obviously a lot more to it than that, but this is the general idea. Content ID is YouTube’s way of automatically recognising a piece of copyrighted material in a video and thus allow the owners of that material to decide what to do about it (i.e. ban it or collect money from it etc.). In today’s world, where there is so much content out there that it is hard to get noticed or heard, the Commons is a useful framework in that it allows your work to get used, and hopefully your name noticed. By putting my music on sites like the FMA (Free Music Archive – a place to share Commons audio), it has allowed me to get some small level of exposure that I might not otherwise have had. Of course, having got some exposure, it is nice to be able to get some income back from it, and to date, YTAR has proved the only bit of meaningful income (above the usual 0.0002 pence one seems to get from the likes Spotify etc. ), that I have managed to achieve. 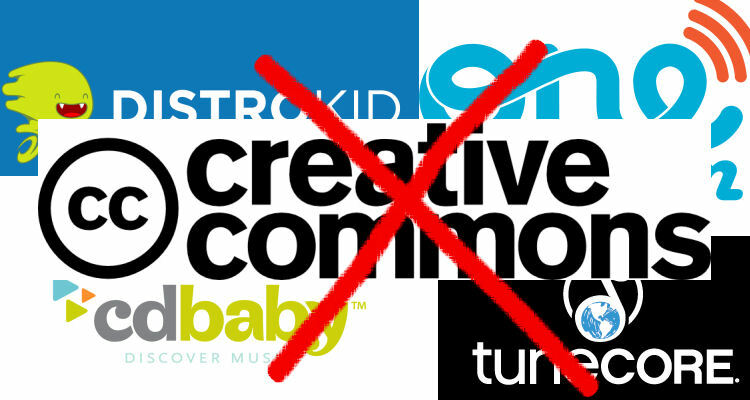 Due to the potential for copyright infringement concerns with public domain/creative commons releases, DistroKid does not currently distribute music in the public domain/creative commons, for your own protection, as well as ours. You would be welcome to upload, release, and distribute this music through CD Baby, but please do not opt it in to our Sync Licensing/YouTube video monetization service. Only your own 100% completely original, non-Creative Commons compositions are eligible for our Sync Licensing service. It’s ok if someone uses other content that has been released under a CC BY license in their own music, as long as proper credit is given (as per the Creative Commons license). We can distribute this music. However, it will not be submitted into the YouTube Content ID system. We can monetize audio on YouTube but not under Creative Commons licence. At this time, we are not accepting public domain/creative common projects. We wish we could accommodate you request but retailers are beginning to reject these types of releases due to having to police potentially copyrighted material. For the avoidance of doubt, YouTube Recordings incorporating the following types of content are not eligible for inclusion in YouTube Monetization (each, an “Ineligible Recording”): …. (ii) content released under Creative Commons or similar free/open licenses; …. Unfortunately no, we won’t distribute any music available via CC license for YouTube Content ID. However, this is not the end of the story, because, saying you don’t accept CC material is one thing, and actually not accepting it is another. This is because there is no reliable way to ascertain if anything has actually been released under a CC licence or not. That being said, we do not have any way to block or even know if content is in Creative Commons. But if it is opted in and we receive any complaints or are notified of any problems, we will opt the content that is causing the issue out of our Sync service. So basically they, and I suspect, all the other distros will accept CC material because it’s too hard for them not to, but they will bin it if there is a problem and have indemnified themselves from doing this in their terms and conditions. If you’re not part of it, you’re losing out on opportunities to make new fans, promote and share your music and, perhaps most importantly, leaving a lasting imprint. You can monetize royalty-free or Creative Commons content if the license agreement grants you rights to use it commercially. Well, who knows, is there a growing undertow against this new paradigm of sharing from those whose vested interests lie in the established copyright system (please note I am not against copyright per se)? But why would the distros want to turn away content from which they might profit? Our experience is that it causes too much confusion and frustration, and the way we see it, once you offer your content to be used royalty-free, you are no longer entitled to monetize that content if/when someone else uses it. You always own the rights to your own work and can enter into any agreement you wish with your work. So what next and where is all leading? Well, personally I think it would be a shame for CC material to be blocked or marginalised. I think the Commons has been great at allowing the use of material, under certain restrictions, where otherwise it might have remained undiscovered. And if the creators of such material are not able to profit from it, then they will likely lack the motivation to go on creating it, nor have the time to, due to having to do other jobs to support themselves. I think YouTube could go a long way to resolving this problem, since their payment system makes it very difficult to share the income from a video between the music creator and video maker. It’s a very blunt instrument where it usually only awards the ad revenue to the music licence holder and not the video maker. This is a big cause of the conflict between users of CC music and it’s creators, where both are trying to get their share of the ad revenue. To date YouTube have not been very forthcoming on my enquiries into this, but that is a subject for another article. I will add that TuneCore have so far been very helpful and accommodating in allowing me to put up my CC audio and also revoking their claims on a case by case basis, where it might have conflicted with a user who I felt deserved to keep the ad revenue. However whether the other distros will follow suit, and whether this approach from TC will be sustainable, is another matter. In short, the people that hold the keys to the distribution of content – YouTube (i.e. Google) etc.- need to give the creators of that content the tools to be able to get their share of revenue from it in a fair and transparent way. In this way the distros will hopefully be more open to accepting CC material, in the knowledge that it is less likely to cause conflict. Otherwise the whole system is in jeopardy. Meanwhile, be aware there may be problems with CC material, certainly in relation to YTAR. We’ll have to see what the future brings, but I hope it’s one that benefits everybody.